The Signal and Information Processing for Sensing Systems group’s student’s thesis, ‘Detecció d’estats inadequats per la conducció d’un vehicle a partir de la degradació del control dinàmic’, was selected for its “direct applicability and market-minded approach, as well as its impact on improving road safety”, according to the judging panel. Her research carried out in Santiago Marco’s group was connected to the driver drowsiness alerter developed by IBEC and the company Ficosa. Launched in 2014, the Premis PIONER recognise those researchers who have presented a doctoral thesis with results that are clearly aimed at commercial exploitation. Thus is the first year that an IBEC student has won one of the prizes, of which there were three winners in 2014 and five in 2015. The jury in this third edition of the Premis PIONER was made up of Eduard Balbuena, professor in the UAB’s Department of Enterprise, Josep Maria Pujals, a lawyer at Oficina Ponti, Anna López Lozano, director of intellectual property at EQ Esteve, Joan Pere Cardona, PI of the Experimental Tuberculosis Unit at the Germans Trias i Pujol Research Institute, and Adrià Batlle, director of mVenturesBcn. 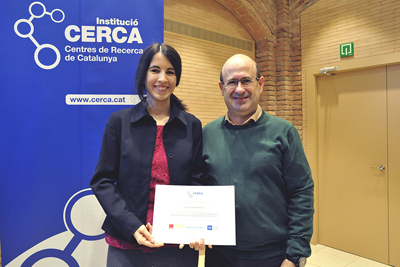 Ariadna received her award with the four other 2016 winners at a ceremony on 21st December.